"Dee Why Wide has a huge ship's anchor stuck in a crack"
Over the previous three years Kelly and I have visited Tasmania twice. The first time we flew into Hobart and spent four nights in the Port Arthur, Bruny Island and Hobart areas. 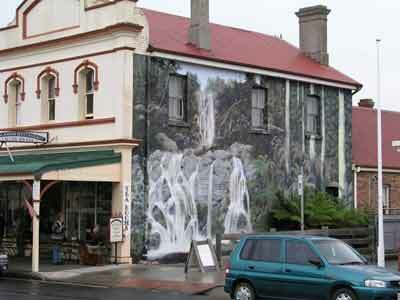 In May 2006 we flew into Launceston and went to Cradle Mountain, Stanley and Wynyard areas. On that trip I proposed to Kelly and we had a great time. Both of these trips were quite short and we could only see a small bit of what Tasmania has to offer. In addition, our trip to Cradle Mountain was cut a bit short when the plane down was affected by fog in Melbourne and our luggage did not catch up with us till it was late, limiting our ability to do walks in the area. We vowed then to come back to Tasmania and spend a month diving and camping around the whole State. This is the story of that trip. Before leaving Sydney, we purchased new tyres for the Prado. These are B.F. Goodrich All-Terrains the same as the ones we had on before. The last ones lasted 75,000 kilometres but really suffered a lot of damage and wear during our Victorian High Country Trip in December 2007. We also had a wheel alignment which has markedly changed the steering of the car for the good. We leave Sydney at about 6:30 am and travel down the Hume Highway. From our house it is pretty simple, turn right at the end of the street and two left turns and you are on the F5 which becomes the Hume. Follow this for almost 900 kilometres and you are there. We did not stop at Jugiong as per our trip to the Victorian High Country in December 2007. Instead, we have morning tea at the Mundanoon Rest Area about 17 kilometres before Yass. It has a nice picnic area and toilets. We arrive here at 9:20 am and leave at 9:35 am. 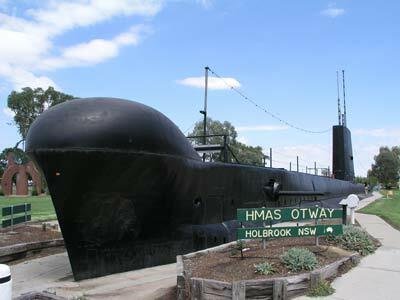 From here we stop in Holbrook (north of Albury) as it has one of Australia's old Onslow class submarines, HMAS Otway on display in the park in the centre of the town. It is not the whole submarine as I had originally thought, it is the superstructure with a fake concrete pressure hull (the bit the men live inside). There is a small section of the rear pressure hull but this only has fake props. Anyway, it is interesting nonetheless. We spend 15 minutes here and leave at 12:11 pm. We continue south. Unlike last trip, we do not stop at Albury for fuel as the Prado has enough to get us to Melbourne without refuelling. We stop just past Albury at the Chiltern Park Rest Area (in Victoria of course) for lunch. We arrive at 1:10 pm and found a very nice spot to have lunch. It even has undercover car parking places. We leave at 1:33 pm. It is very dry in this area and we again continue south on the Hume Highway. 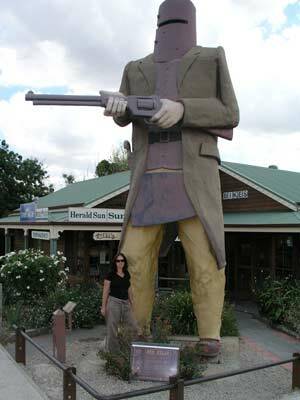 We pull into Glenrowan at 2:05 pm. This is the place where Ned Kelly was captured. Since Kelly was named after him, we thought we would stop and have a look at the town. We have a quick look around and even purchased a Ned Kelly wine ($24). We leave at 2:26 pm and we arrive at Preston, a northern suburb of Melbourne, at about 4:30 pm. Here we refuel ($175) and look for a local Chinese restaurant as after the long trip we are not keen on cooking tonight. However, we cannot find one. 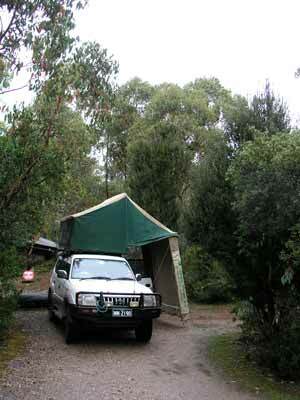 We drive to the Big 4 Cabin Park at Elizabeth Road, Coburg, only a few kilometres away. I have booked a powered site as I want to make sure that the battery is fully charged as tomorrow we have hardly any driving and the fridge would otherwise be running for 40 hours without hardly any battery charging. We book in and set up camp, connecting the battery to the charger and running the fridge on 240 volt power. This is a very nice caravan park, but you need to book ahead (as I did) as it seems to get very full. We find that they have the menu for a local Chinese so we order some to be delivered. We have a swim in the pool as it is quite warm (26ºC). 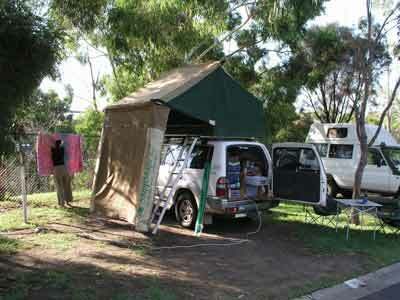 The food is delivered to the front of the caravan park and we eat it with a few beers under some trees next to our car. It looks like most of the caravans are also heading to Tasmania, as we hear quite a few of them chatting about the upcoming trip. We go to bed at about 9:30 pm. We are up early and leave just after 6:50 am. The advantage of being in a caravan park is that we can have a shower before leaving (too much work if camping out in the bush) and we start the day refreshed. We start following some directions I have downloaded from Google Maps but we come to a dead end as the road shown does not connect onto the freeway. So much for technology! We back track and head towards the centre of Melbourne via the Hume Highway (Sydney Road). 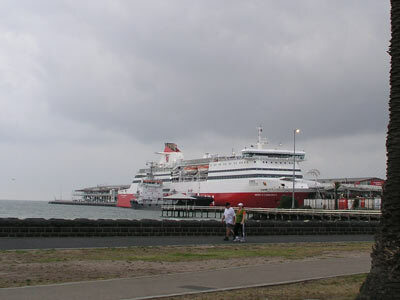 We travel via the City centre to Port Melbourne from where the ferry leaves. It is only a 45 minute trip (should have been about 30) and despite using our directions off Google Maps, we find the ferry terminal easily. We queue up and by just after 8:00 am we are on the ferry. It is a nine hour trip across Port Phillip Bay and then Bass Strait. The bay is flat as a tack as we head across and about half way across a bunch of jet skis come up behind the boat. We try to figure out what they are doing so far from the shore when the answer comes. They are jumping the large wake that the ship is producing. They stay with us for the next half hour or more till we pass Portsea. We start approaching the heads at 10:30 am so we go up on deck to have a look as we dived this area back in February 2005. The navigable part of the entrance is quite narrow and when the incoming or outgoing tide is in full flow, it can be quite dangerous to cross. It is easy today in a boat this size and we see the site where we dived the J4 submarine on the 2005 trip. We are out of the bay by 11:15 am. We are now out in Bass Strait which can be one of the most treacherous stretches of water in the World. Luckily, the ferry is quite large (29,338 tonnes, 194 metres long and carries hundreds of cars - 2,565 metres of lanes - and at least 748 passengers). It is pretty calm at first but it got rougher for a couple of hours after lunch when the wind went south east and about 20 knots. It became calmer about 4:45 pm and at 5 pm we could see The Nut at Stanley. We spend the trip reading and walking around, but we do not even see another boat or ship. I also purchase a permit for Tasmania's national parks for two months for $56. My Telstra NextG mobile phone worked for the whole trip, there is obviously a tower built into the ship with a satellite transmitter. We had lunch at the bistro, $12.50 for a small plate on which you can put as much as you like of the pasta, lasagne, chicken winglets, Thai green chicken curry and more. It was okay. Beers are $3.50 a handle (middy or 10 ounce). We are a little late arriving in Devonport (it was advertised as being due 6 pm but 6:30 pm was what was announced when we left Melbourne). We are off the ferry by 6:40 pm but we have to go through quarantine. You are not permitted to take any fruit or vegetables into Tasmania so you get searched for these things. We are out by about 7:00 pm. We have to go to a petrol station to get some fuel. The car does not need any but we have to get for our Coleman fuel stoves and the chainsaw. You are not permitted to take petrol or diesel on the ship, even in proper containers. The only exception is in a car's fuel tank or a boat fuel tank. We also need to buy some fruit and vegetables and we find a small supermarket down the road that was good enough. From the terminal it is about 47 kilometres to Narawntapu National Park. This is east of Devonport and has a few camping areas. We arrive at Bakers Beach at 7:50 pm but this is one of the poorest excuses for a camping area that I have ever visited. I am extremely disappointed as we set up camp at the site we have chosen (the best spot as far as I can see). There are lots of camp sites, but very sandy and dusty and you are not allowed camp fires for some reason, even though each site has a fire place (it was not a temporary ban as far as I could see). It was $12.50 for a site but as you have to pay as you enter and I was not willing to pay without seeing, I decided against paying the next day when we left. Avoid this place. The camping area near the visitors centre looked much better as we leave the next morning. 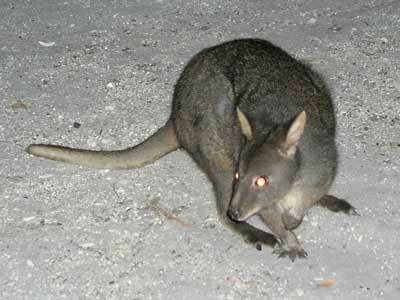 Anyway, there are lots of pademelons (a sort of very small kangaroo) as well as Bennetts wallabies and foresters kangaroos. Kelly cooks up a stir fry and we have a few beers and wine before going to bed at 10:30 pm. Despite this poor start to the trip, it is good to be in Tassie and we are really looking forward to the next four weeks. Kilometres: 75 Weather: Sunny and about 25ºC. It became quite windy during the night and we have a relatively early start to the day. For our whole trip to Tasmania, there are only a couple of days where we will need to be up real early and most of these are related to diving. Our original plan for this trip was to basically circumnavigate Tasmania in a clockwise direction from Devonport. 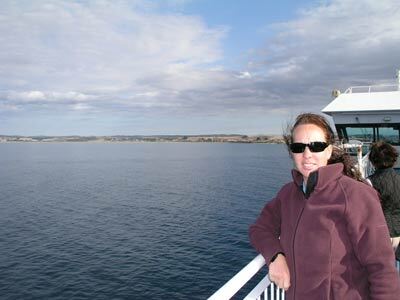 However, when trying to find out about diving, the Tasmania Scuba Diving Club kindly offered to take Kelly and I diving on a dive trip they had planned for Rocky Cape on the weekend of 8 to 9 February. This is located to the west of Devonport so I had to reorganise the order in which we do the trip. Therefore, instead of heading west from here, we head south and will do a loop in an anti-clockwise direction so that we end up back at Rocky Cape on Saturday 8 February. We head out at 8:30 am and originally we planned to go direct to Sheffield. However, it has started raining heavily so we decide to go via Lower Barrington and the Devils Gate Dam. We go through La Trobe (where I buy some beer and wine - we need at least a week's supply) and arrive at Devils Gate Dam at 9:50 am. 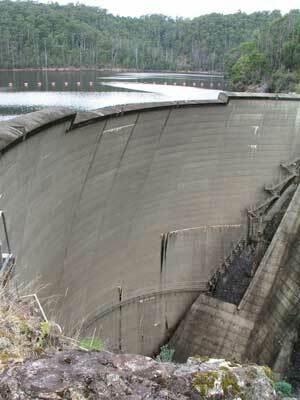 The dam wall is the thinnest large dam wall in Australia and holds back Lake Barrington. This is the location of one of Australia's most prominent rowing courses where many Olympic trials have been held over the years. We have morning tea here and leave at 10:15 am. We then go to Sheffield. We visited this place last time we were here and I figured I wanted to see again. However, it is raining very heavily now and it is too wet to walk around a town that we have already seen. Instead, we go to the supermarket to get some meat balls (I left the ones I purchased in the freezer at home) and a couple of other things and we then head south to Mole Creek. On our last trip we did not get a chance to visit the numerous caves that are in this area but this time I have planned to visit at least one of the caves. 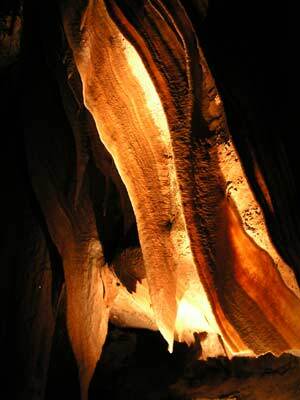 We travel via the Mole Creek Caves Visitor Centre where we purchase tickets ($15 each) for a guided tour of the King Solomons Cave and we arrive at the cave's car park at 11:50 am. The tour is not till 12:30 pm so we have a cuppa as we wait. It is still raining. 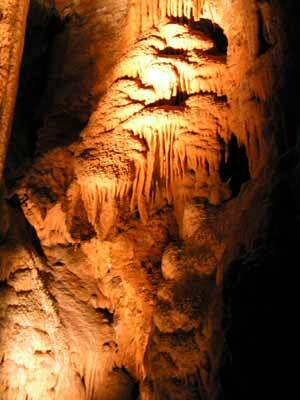 The cave tour is quite good (but cold inside at 9ºC) and we are back at the car park at 1:30 pm. We have lunch in the excellent shelter shed as it is cold (16ºC) and wet outside. We leave at 2:10 pm. After this we head towards Cradle Mountain. It is not too far from here in a direct line but a bit further by road. 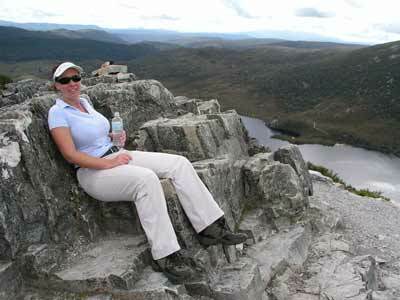 We go to Wilmot Dam Lookout at 3:00 pm and we arrive at Dove Lake in Cradle Mountain National Park at 3:50 pm. It is still raining and 14ºC so we only walked down to the lake's edge where we made the best decision of our lives in May 2007 (that is, asking Kelly to marry me and her agreeing). The fog is low over the lake and we drive back to the camping area without much hope that we will be able to have a good walk tomorrow. 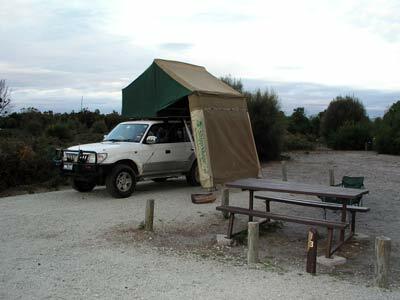 We arrive at the Cosy Cabins Cradle Mountain Tourist Park (the only camping area within about 50 kilometres or more) at 5:30 pm and we book into the camping area. One thing I found when researching this trip is that there is a huge amount of repetition on the Internet that makes it very confusing when trying to see what accommodation, whether it is hotels or camping, is available in an area. There so many sites ripping off companies when it would be far better for these establishments to have their own simple and easy to upkeep web site. In addition, when there is some mention of a provider, the details shown are so scant to be useless. As such, I had no idea what to expect about this camping area as it is so poorly represented on the Internet (a fact that we discovered with many operations when planning this trip). Anyway, my little gripe over, we book into the camping area. The camping area is quite good, with each site separated from the others by vegetation. 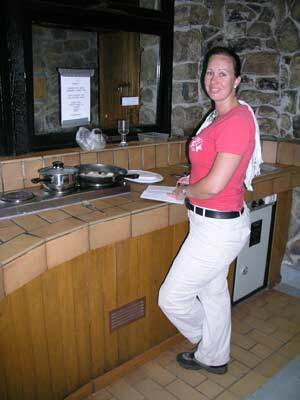 There is an excellent camp kitchen (two I think), with two fires to keep us warm. As it is still raining, we set up our Shippshape before taking all our dinner things and a few beers inside. It is nice and warm and full of mostly backpackers. There are two BBQs inside (as well as four outside), hotplates, a kettle and a toaster. We read and have a couple of beers in the warmth of the room. We take turns to have a shower so that we do not lose our table. While Kelly is in the shower, I see a small black thing run by the glass windows. 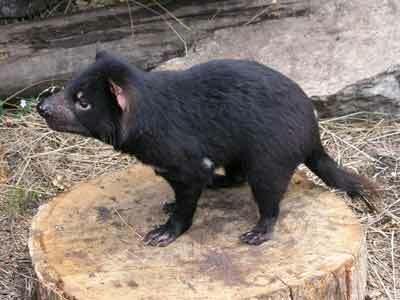 A few others see it and I am sure that it is a small Tasmanian devil. We all rush outside and sure enough, just up the track it sits, looking at us. One person gets a photograph before it runs off into the bush. Fantastic!! After this Kelly cooks us a nice Mongolian chicken dinner. After dinner while we have another drink and read some more (we are both rereading all the Harry Potter books). It stops raining about 9:00 pm and we go to bed about 10:00 pm. Today we are going to do a few walks. Last time we were here we only had time to do a walk part way to Cradle Mountain due to the plane problems I have already mentioned. After breakfast, we leave the camp site at 8:50 am and drive back to Dove Lake and set out on another walk. This time we are planning to walk the entire way around the lake on the top of the ridge. We leave the car park at 9:20 am and head off towards Wombat Lake. From here we go to Marions Lookout. It is sunny and warm and we build up a good sweat. The track is quite well built and relatively easy for the most part. Even though it is not that warm, the sun is out and we are soon sweating as we climb the track. 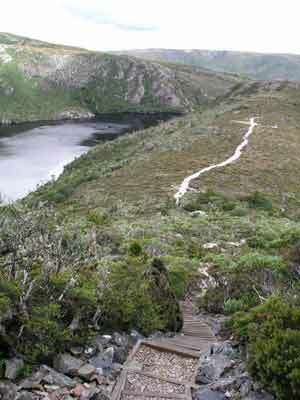 The track runs along the ridge between Wombat Lake and Dove Lake and gives nice views off to the north as well as over both lakes. The section of track closer to Marions Lookout has a steep section that has a chain that you use to help pull yourself up the track. The views from the lookout are excellent. You can see the whole lake as well as other lakes like Wombat. We have morning tea here. 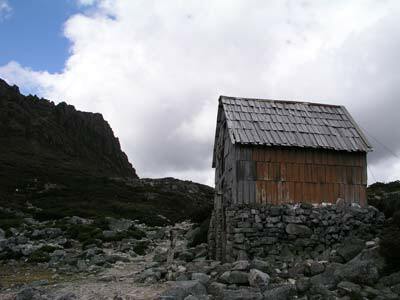 There are now a lot of walkers around, some doing the full Cradle Mountain to Lake St Clair Overland track and many doing a walk similar to what we are planning. There is another way up to here from the car park and most appear to have taken that (easier) route. The views from here are spectacular. Even if you cannot do any other walk, try to get up to this spot, it is really worth it. After a short break we head off towards Kitchen Hut. 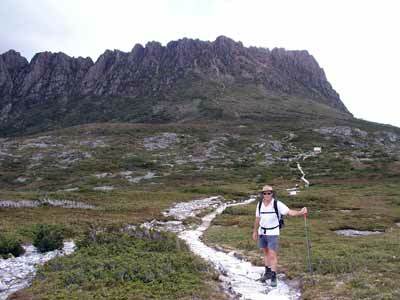 This is just under the main rock face below the Cradle Mountain peak. The track here is flat again and it rolls up and over the small hills, crossing a peat-like bog (that is pretty dry). The old hut looks very interesting so I open the door. Inside I see something run across the floor into the area beside the chimney. I go outside but see nothing. I can hear whatever it is moving around inside. I go back in the hut and can hear a noise from the upper level. I go up the ladder and see a head sticking out of the walls. 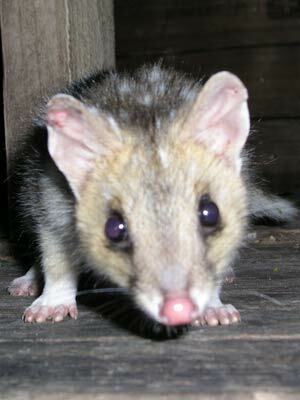 It is an eastern quoll. These user to be called native cats and are quite rare in New South Wales. 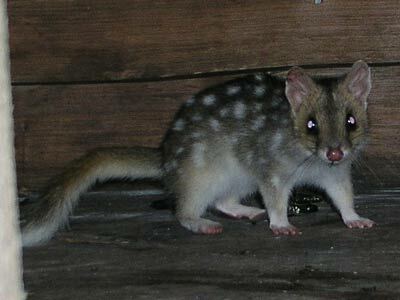 I call out to Kelly to come and the quoll comes out of the wall and is now walking around the upper level. I get the camera and get some photos. It is so tame it comes right up to within 200 mm of my camera. Amazing! A very, very cute eastern quoll The eastern quoll got so close! We continue on the walk and soon are traversing across the section of track below the rockface. This is a lot harder going. The track is much rougher and it is steep up and down in short sections. Eventually we start down on a steep section that has a chain to assist. We stop at the emergency hut just near here and have lunch. 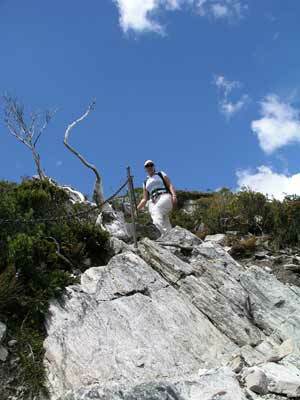 We continue on the track which now runs on a ridge between Dove Lake and the other lakes to the east. We have done most of this section of the track in 2006. We get back to the car park and have a cool drink. It has taken us about five hours to do the walk. We head back to the camping area and on the way decide to visit the Devils@Cradle. This is just before the Camping Area. It costs $15 to go in. We see a short documentary on Tasmanian devils, especially the facial tumour disease that is killing them off. Then, we are taken outside by a very committed biologist and we visit up close a lot of the devils. Some of them are so cute. We get to pat one and we get an excellent talk on devils and the problems they are encountering (it mostly appears to be inbreeding that is causing the cancer) as well as the breeding program being conducted here. Well worth visiting, as you learn a lot, see Tasmanian devils up close and contribute to the attempts to save them. We get back to the Camping Area at 4:15 pm. We are lucky enough to get the same spot as last night (right next to the kitchen) and we have a shower before retiring to the camp kitchen for a few pre-dinner drinks. It started raining soon after and a small hailstorm dropped a layer of ice all over the camping area. We cook meatballs for dinner and find out that one of the couples here stayed with a work colleague a week or so ago. A small World. The rain stops about 8:30 pm and we went to bed at 10:00 pm.